This week’s Photo Challenge is Lost in the Details, and it reminded me of a challenging time I had photographing The Angel Oak in Charleston, South Carolina. The Angel Oak is estimated to be 300 to 400 years old and is thought to be the largest Live Oak East of the Mississippi River. With a height of 65 feet and covering 17,000 square feet of shade, The Angel Oak’s immensity is difficult to capture in one frame without losing perspective. At the end of the day, I found my favorite images were those focusing on parts of the tree, the details that hinted at the true expanse of this oak. In this frame, the limbs just seem to stretch on forever, and when you stand underneath the tree, that’s really how you feel. It’s as if you’re in the middle of a tree cocoon, sandwiched between a thick layer of fallen leaves below and green, leafy branches above. 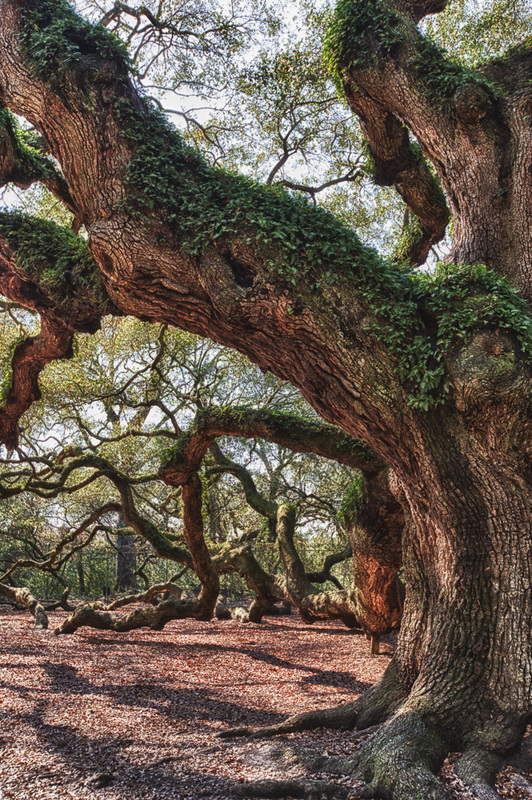 The Angel Oak is amazing, and I plan to return to take up the challenge again. This image was edited in Color Efex Pro 4 using the Detail Extractor and Contrast filters. This is an amazing tree, and you found the perfect perspective to showcase it. I can imagine the stories this tree can tell. So true! Think about all of the things that have happened in the past three to four centuries, especially the Civil War right in its backyard. So much history and change. Now kids sit in its shade and text and email photos around the world! This reminds me of the beloved Wye Oak, may it rest in peace, but even more of a Holly i discovered by accident one day in the Wye Island area. it was hundreds of years old and had the same sweeping, reaching branches. But what I remember most is the feeling of intenst energy and peace that came over me while I was under the tree, within its embrace. I’ve tried to find it again but haven’t yet, even looking for it on Google maps! Wow, it would be nice if you could find that Holly again. That’s how I felt standing under the Angel Oak; a feeling of energy and life but also safety and security. If you haven’t done so, perhaps an email to the Maryland DNR might turn up a clue. They’ve been super helpful in the past when I’ve asked questions. Keep me posted if you find it! The detail of the bark is beautiful and the light you have caught shining up under the trunk makes the shadows dance.